DAMA Puget Sound Chapter held a summer CDMP Exam Prep Bootcamp on July 13-14 at the Best Western Executive Inn in downtown Seattle. There were 14 attendees, one of the largest classes held in Seattle. 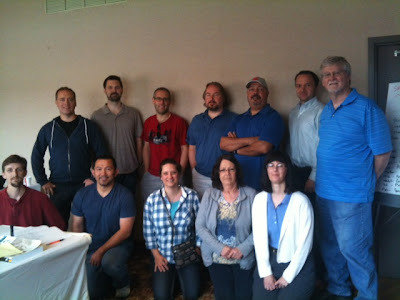 Two attendees even made the trek down from Vancouver, BC to get certified! Others are currently employed by local organizations such as Premera, Costco, Expediters, Group Health, Microsoft and Russell Investments. Amidst a Seattle-style thunder storm on Friday, the class forged ahead to complete the IS Core and the Data Management Core exams on Day One. With two out of three exams under their belt, Day Two was a lot less stressful for most. By the end of Day Two, an amazing 100% of the class had successfully completed all exams and achieved the CDMP credential!